Mobile devices are changing the way that business works, from how we interact to with our customers to how we manage our stock. LiveCode is a simple, easy to learn tool that lets people in all aspects of business get involved in this new mobile revolution. This simple, easy to follow tutorial shows how to make a basic management application for the iPad. The app includes all the information normally stored in a standard stock management system and makes it accessible in the mobile space. 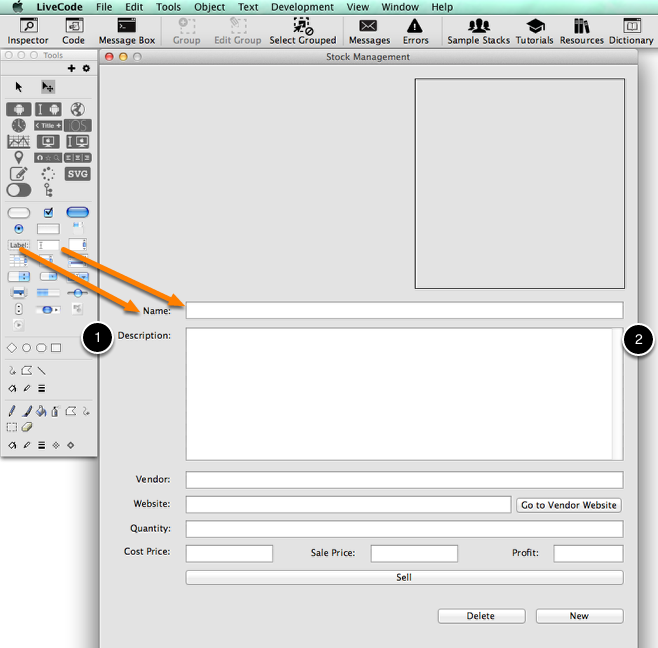 See how to create the interface, use iOS gestures and save the app on your iOS device. Full iOS features are supported and the data is directly editable and easily navigable. When you have completed this sample application you will have a fully skinned and working stock management application that allows users to add, edit and delete items. What do we want to be able to do? The first thing we need to think about is what we want the app to be able to do, what functionality do we need? In this case we are keeping it very simple, all we want to do is store information about our stock. We need to be able to add new stock items, delete items and update information. 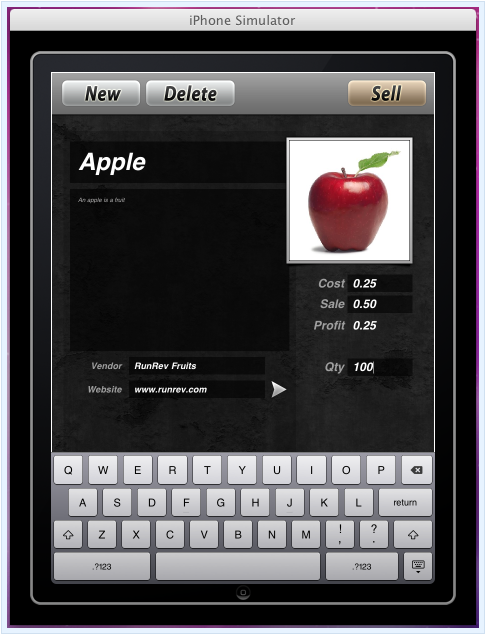 We would also like to be able to go to a vendor's website and automatically calculate the profit and value of our stock. Of course we also want our data to be persistent between uses of the app so we need to save the data on the device. The first thing to do is to create a new stack by selecting New Stack from the File menu, open the Property Inspector for the stack using the Inspector button (1) and set the name of it to Stock and the label to Stock Management. Then select the Size and Position tab (2) and set the width of the stack to 768 and the height of the stack to 1024. This is the screen size of an iPad in portrait orientation when the status bar is not showing, if you want to show the status bar in your app then set the height of your stack to 1004 to allow 20px for the status bar. Turn off the resizable property (3). Note: in this tutorial we will only allow Portrait orientation. When you have finished this sample application you could expand it to support landscape orientation. Now we need to add fields to the stack to allow us to enter and display details and an image are to allow us to select a picture. We also need buttons to go to the vendor website, add a new stock item, delete a stock item, and sell a piece of stock. You build your interface by dragging controls from the Tools Palette to the stack, you can select and drag controls on the stack to try different layouts. Once you have added the controls to your stack use the Property Inspector to name them, for example I have named field 1 "description label" and field 2 "description". Giving controls memorable names makes them easier to refer to later in code. To go to the website specified in the "Vendor Website" field we can use the LiveCode launch url command. 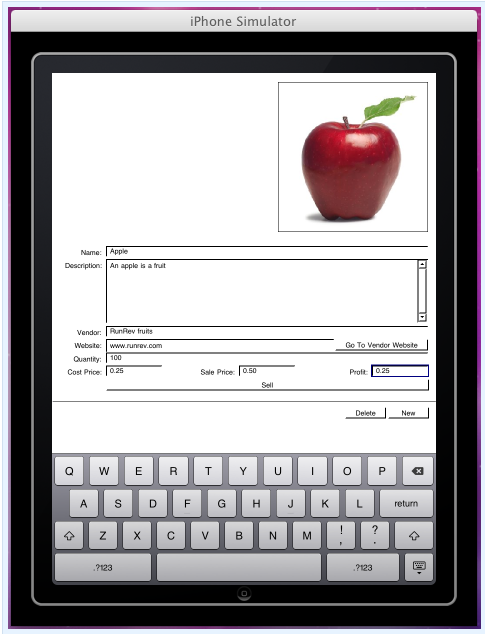 It is simple enough to use fields to enter text data but what do we do about selecting an image? For this task we will use the mobilePickPhoto command. The command "mobilePickPhoto" takes a single parameter that defines what type of choice to use, once the user has chosen an image the selected image appears on the stack and can be manipulated. In this case we want the user to select in image from their library so we use the command mobilePickPhoto "library"
# If the result is empty you know the user has chosen an image and you can start working with it. This will only work on an iOS device so we will test in in the simulator later, and then on a device. A LiveCode stack is made up of a series of cards. We will use one card per item, each card will store the information on a particular piece of stock. We can add new items by adding card, delete items by deleting a card and navigate through the stack by moving between cards. To add a new item we want to add a new card to the stack. The new card should contain all the controls we have set up ready to be populated with the information about the item. There is a simple way to do this in LiveCode. By grouping the controls together and setting the Behave Like a Background property of the group to true the controls will automatically be added to any new cards that are created. To do this select all the controls, choose the Group option in the menubar (1), then select the group, name it "controls" (2) and set the Behave Like a Background property to true (3). The only control we can't include in the group is the image control, this is because the image data is not distinct for each card when contained in a background so we will copy the image to each new card separately. Once there is more that one item in the application we need to be able to move between them. As this is an iPad app we want to use a sliding movement to move between records. When moving forwards through the items the old item should slide off the left hand side, when moving backwards the old item should slide off the right hand side. We want to be able to move between records by swiping left or right and moving through the items accordingly. LiveCode provides touchStart, touchEnd and touchMove messages allowing you to detect swipe gestures. By recording the start and end points of the touch and calulating how far the user has swiped, and it what direction you can detect and handle swipe gestures. At this stage we will try using the iPad simulator to test the app. Save your stack, open the Standalone Application Setting from the File menu and go to the iOS pane. Editing an item couldn't be simpler. You just click in the field and edit the content. When a card is deleted the next card is shown automatically. By setting the visual effect first the effect is used to show the next card. If we just build our application into an iOS standalone it wil work fine but we won't be able to save our data as you cannot save changes to an standalone application. Instead we need to create a launcher application, which in turn launches a version of the Stock Management stack which can be saved. 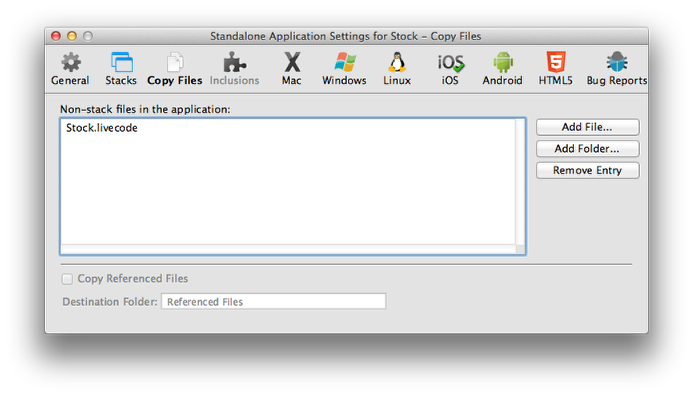 We save the launcher as standalone and include the Stock Management stack in the application bundle. iOS imposes strict controls over what you can and cannot access so we use the specialFolderPath function to access the documents folder, this is the folder in which the application should store any document data. When we first launch the application we copy the Stock Management stack to the documents folder and launch it from there, when saving the stack we save it back into the documents folder. The next time we launch the application we launch it directly from the documents folder as this is the version containing the information. We want to save the stack when the app is closed so that our data is available the next time we start up the app. When the app is closed a shutdown message is sent so we need to add a shutdown handler to our stack script, this uses the save command to save the stack. To create a launcher stack we create another iPad sized stack, name it Stock Launcher and set the label to Stock Management. This stack shouldn't be seen but we will set the background color to black in case it is seen while the main stack is launching. You can add a "Starting Up" message if you like. Open the script editor for the stack and add the following handler, this launches the main stack. We then build the launcher stack into a standalone application(with the same settings as before) including the Stock Management stack as a file. You can now deploy your app to an iPad and do some testing. Ensure that the gestures work, that you can add, edit and delete stock items and that your data is still there the next time you start up the stack. To make the app more attractive you can do some very simple skinning. In this example we have simply used a background image and some button icons. These are all available in the zip file attached to the tutorial. Import the background image using the Import as Control option in the File menu. Then use the Size and Position pane of the Property Inspector to set the layer of the image to 1, this means it will be below all the controls. 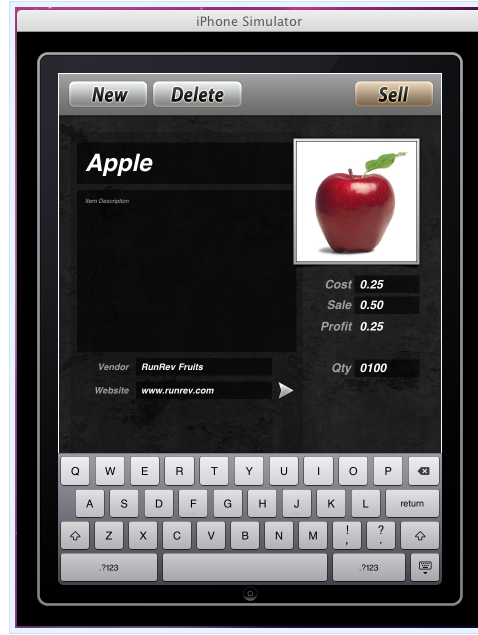 You can then move the fields, image area and buttons around to achieve the desired layout. 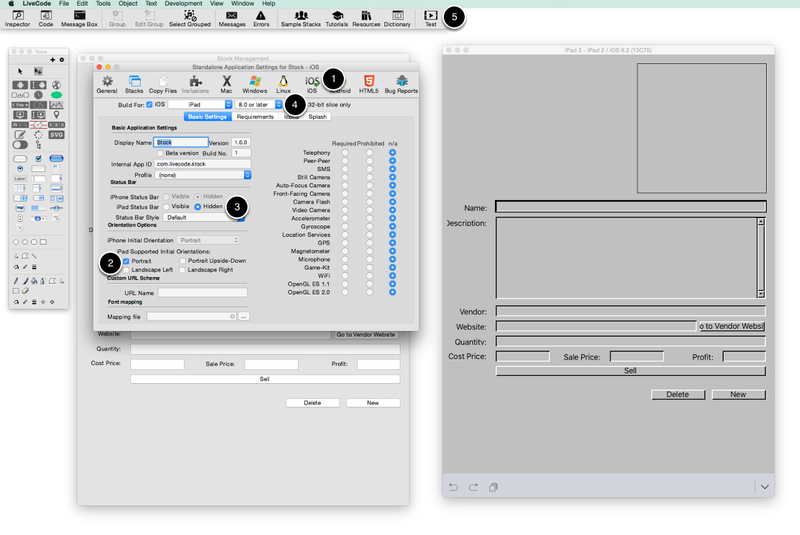 For a more detailed lesson on customizing the appearance of LiveCode apps please see the Skinning lesson. 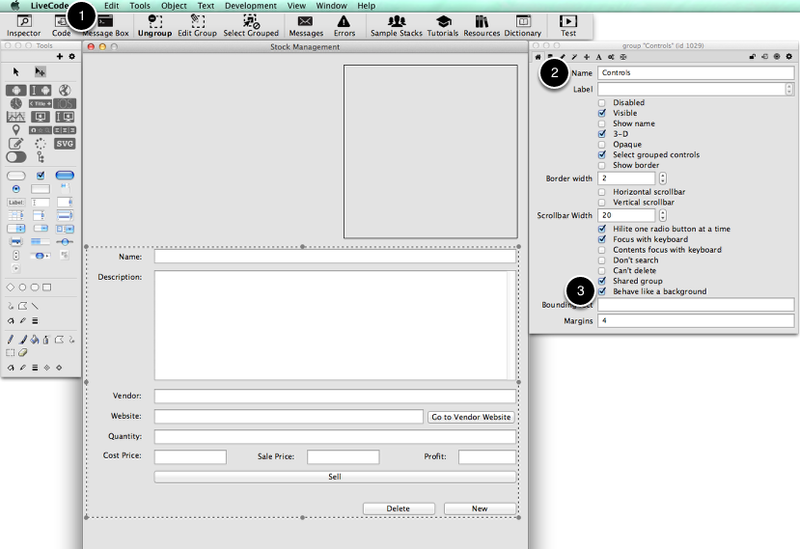 This goes into detail more detail on using background images, button icons and window shapes. Prev: How do I Access Maps on iOS? Next: How do I Create a Distribution Profile for iOS? I read this How To as I thought it would run through the basics of using a database to store the product data. I was very surprised to see that a new card is created for each product. Would this result in a large filesize after adding many products? Would it be possible and better to use SQLite to store the data in a database? I am working on a similar app that I want to use on the iPhone. When the app starts up, the keyboard comes up and covers most of what I want to be viewable. in the property inspector for each field, you could untick the "Focusable" check box on all fields. This will hide the keyboard for you. Once you get to a point where you would like the user to enter data, you can make the fields focusable again by setting the "traversalOn" property to true for the fields into which you would like the user to enter data. The field on the highest layer will be focused first, this allows you to control implicitly which field should be focused on first. how can i enhance the swipe code so it can handle an angular swipe for e.g. swiping an object then it launches in a projectile manner. It only stored the x-coordinate of the swipe data how can you store both x and y co-ordinates. both the x an y coordinates are passed to the "touchMove" message, so you should be able to pick both of the parameters up from there. Have a look at the LiveCode dictionary for more information on this message. You can convert the cartesian coordinates to polar coordinates, giving you the angle of the swipe. You may have to adjust the values for each of the quadrants (x,y or x,-y or -x,y or -x,-y). You can find a lot of information on the internet regarding conversion between these two representations. touchMove only has three parameters, not five. The last two parameters indicate the current x and y position on the touch screen. I think you could also drop the ["xStart"], ["yStart"], ["xEnd"] and ["yEnd"]. Try using sCoordinateArray["start"] and sCoordinateArray["end"], if you are only trying to find the start and end vectors. is a good starting point but you should replace the "and" with "&&". "and" is a logical operator where "&&" is a concatenation operator that inserts a space between its two arguments. Once you reach touchEnd you should get space delimited values in "tStart" and "tEnd". You may also want to put a condition into the touchEnd event handler to test if sCoordinateArray["start"] and sCoordinateArray["end"] are populated. I was wondering if there is a way to create a card in desktop and then share it with ios either through iTuens or iCloud or both? If yes then can you please explain how? LiveCode does not have built in connectivity to iTunes or iCloud. There may be APIs that allow you to connect to these Apple services. Have a look what is available on the internet. Depending on the possible APIs you may be able to interact with them using the LiveCode "shell" command or you may have to write a LiveCode external that interacts with c/c++ libraries. It really depends on the interface that is provided, if any. Wow, the swipe gesture control works brilliantly. And the code so elegant. This really will enhance the user experience in iOS7. Thank you very much! How would save a picture captured with the mobilphotopick that is put into an image object on a card so when that card is called the picture will appear. I'd like it to save and call the mage to/from the camera roll. Have a look at these entries for manipulating file data from your application.